A central pillar for your music playback system. 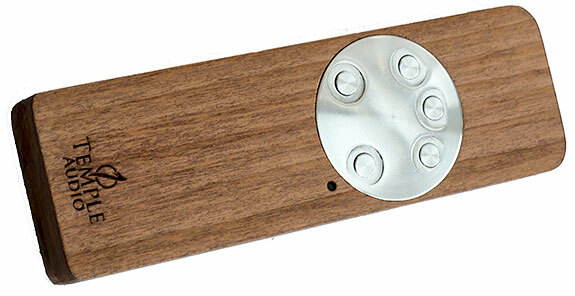 Temple Audio has a strong niche following amongst audiophiles seeking excellent sound at incredibly reasonable prices. 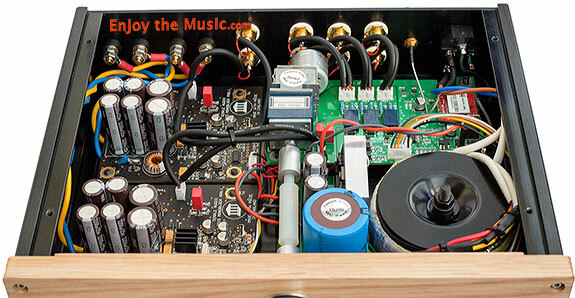 In May 2014 I reviewed the Temple Audio Monoblocks. The Monoblocks are ridiculously good regardless of their low price; they are based on an Analogue Devices silicon chip which seems to be uniquely used by Temple Audio for Hi-Fi. My view is that the Temple Monoblocks sound can be optimized by substituting battery or linear power supplies in place of the standard switching power supply. The switching power supply gives a decent enough sound but I'm one to experiment where I can, hence my using batteries with the Monoblocks. Enter the Temple Audio Bantam One which put a stop to my experimenting. The Temple Audio Bantam One is an integrated stereo amplifier built around the Temple Audio Monoblock design; it has a passive preamp with three relay-switched inputs, a preamp output and a pair of the speaker outputs. The preamp output means there is no issue with accommodating as subwoofer or second power amp for active speaker operation. The Bantam One packs a lot into a small footprint, it is fractionally under 11" (30cm) wide, 8.5" (22cm) deep and under 3" (7cm) high, it's a compact powerhouse. The casework as ever with Temple Audio is bespoke with their machining executed in-house. There are a couple of options for the fascia, Walnut and Light Oak; both are lovely chunky pieces of wood. The fascia carries a volume control and the power button which also lets you switch inputs; there are three LEDs to indicate which input is selected. The controls are machined by Temple, they are not simply parts box sourced and bolted on. The metal control parts are turned and milled from solid aircraft grade aluminum billet. These parts are made to a 0.05mm tolerance and the volume control knob runs in a high quality race bearing to give it a solid but smooth feel. The main chassis is a nicely finished aluminum box which bolts together; it's not a low cost bent metal case. There is also an optional remote control, more of which later. The power supply built into in the amplifier is regulated and in part dual mono. The toroidal transformer feeds the rectifier, this then feeds pre-regulators and final regulator pair; each regulator pair powers its own power amplifier board. There is also a third output which powers the onboard regulators fitted to the preamp board. The great news as far as I'm concerned it that the power amp boards in the Bantam One do not run from a switching power supply but instead the regulated power supply is a linear type. Don't get me wrong, switching power supplies can be very good indeed but they tend to be very expensive when they are so good, the better inexpensive ones tend to be ok but nothing special. It's very apparent there has been a lot of attention given to the dual mono power supply, it is not just any regulated power supply; it uses a pair of pre-regulators to do the hard work of getting the voltage down to the right ballpark for the two rather special LT1963 which have excellent noise characteristics. I'm told a lot of care is needed to get the LT1963 to work optimally, there needing to be a lot of attention to detail with capacitor values and types; also the circuit board traces and ground plane need to be carefully optimized. The proof of the pudding is in the eating... by this I mean the measured performance will demonstrate whether or not Temple has done a good design and implementation job. The Temple measurements show their power supply to have a noise level better than 0.3mV at 1A per channel; it's actually quite tough to measure this sort of level of noise as it is very low indeed. Not only have Temple done a good job, they've done a great job! I should add that in case 1A per channel doesn't sound like a lot of current for a power amplifier, we need to realize these amplifiers are 90% efficient so crazy current levels are not required. There's a good green element to the Bantam One. The two power amplifier boards are slightly updated versions of the board previously found in the monoblocks; there are beefier power smoothing capacitors and upgraded capacitors on the outputs. The latest Monoblocks also have the output capacitor upgrade nowadays too. These are important components in terms of sound quality. The preamp section is essentially a nicely engineered passive pre; following the three relay switched inputs is an Alps Blue motorized volume control. Some of you may be thinking that an Alps Blue whilst ok is not that special. I would agree the Alps Blue is respectable but not that special when used in a standalone passive pre with a meter of interconnect linking it to a power amp. However when used inside an amplifier with very short signal paths I find the Alps does very well indeed. With a standalone passive pre we are encouraged to take into account the capacitance of the cable between pre and power amp, too much capacitance = not enough treble. The value of the potentiometer (volume control) is important too, it can all get a little complex for a standalone passive pre. 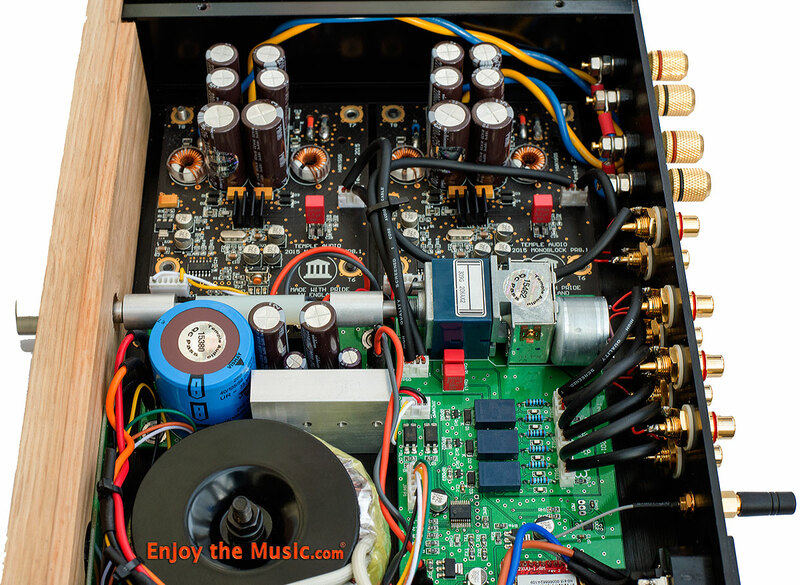 In an integrated amp there are no cable capacitance issues to worry about and the load the potentiometer connects to (the power amplifier) is a known quantity as well. All this results in the Alps Blue performing far better in an integrated amplifier than it does as a standalone preamp, my auditioning with the Bantam One vs Monoblocks + exotic passive preamp totally supports this. Whatever is going on I can say the Alps Blue potentiometer performs admirably in the Bantam One. The preamp section brings me to the subject of gain. As the preamp is passive there is no gain but the input of the power amplifier boards have an option for setting one of four levels of gain. Typically the Bantam One will arrive at a customer set to the second lowest gain level. I estimate the second lowest gain setting equates to an input sensitivity of around 0.7V to 1V, in other words a typical overall input sensitivity shared by most amplifiers. Gain being set to second setting will be fine for most 2V output digital sources in systems with a normal speaker sensitivity of say 88dB/W/m. If you run vinyl much will depend on your cartridge output and phonostage. I'm lucky in that my London Reference feeding my Benedict Audio Hothead gives me slightly more voltage drive than a typical DAC. For those of you with a cartridge & phonostage combination which has less gain you may need to set the Bantam One to its third gain setting. As for the forth gain setting, it may be this is best thought of for "emergency use", I'm not convinced it's as good sounding as the other gain settings. My advice is to use the lowest gain setting you can get away with. When assessing what gain setting you need don't worry about the volume control being at 5 o'clock if that's what's needed. Only increase the gain setting if you need a volume setting greater than the maximum setting. Using an unnecessarily high gain setting means you'll be over-attenuating the input signal with the volume control then unnecessarily amplifying it with the power amplifier... rather pointless. In the unlikely event you need alter the gain setting, this is easy. Remove the Bantam One lid, there are just four screws to remove. Once you have access to the innards the power lead should be inserted with the power on at the wall but the power switch on the amplifier should not be activated such that the Bantam One is in standby mode. Naturally keep away from any mains voltage areas between the mains input IEC socket and mains transformer, the connections are insulated so this is not something which is dangerous but if you are nervous about this find someone who is experienced with electronics. The two power amp boards have a vertical pad-type switch near the Temple Audio logo. Using a non-conductive tool (I use a chopstick) lightly press the vertical button and hold it in. You'll see a nearby surface mount LED flash on the circuit board, one flash for gain setting 1, twice for gain setting 2... you get the idea. Cycle this until you select the gain setting you require, replace the lid, you are now ready to use the new gain setting. The Bantam One remote is interesting. It's a wooden affair with a metal disc with five inset buttons; three of the buttons are for input selection, pressing button for a few seconds switches the amplifier on or off. There are two further buttons to control the volume. I've surely led a sheltered life as this is the first time I've come across a Bluetooth remote for an amplifier. The Bluetooth is set for long range so I can even change volume from a couple of rooms away in my house. This is useful in my situation as my main system in the cellar (basement) so when I want background music in our lounge I've previously had to dash downstairs if I need to change the volume. Not anymore. The remote shouldn't stay powered up all the time to save the batteries so it switches itself off after about an hour; you just need to press a button to turn it back on, there is a short delay whilst the Bluetooth connection is re-established. The hardest thing for me to get used to is that I don't need to point the remote control at the amp... all remotes should be like this. Seeing as I like the Temple Audio Monoblocks so much, especially when run from a lead-acid battery one of the first challenges for the Bantam One was for me to understand how the linear power supply changes the sound of the Temple Audio power amplifier boards. Once the Bantam One had a decent number of hours on it I made the comparison. I used the preamp output from the Bantam One to feed the Monoblock so I had a level playing field for the comparison. Arguably the very short interconnect I used between Bantam One and Monoblocks may have had an influence but I doubt it was much. As good as the battery driven Monoblocks are there's no question the Bantam One improves on the Monoblocks. The Monoblocks with batteries are softer at the frequency extremes and the Bantam One exhibits a more open mid-range. The Bantam One has greater presence � I put this down to the low output impedance of the linear power supply more than the recent changes to the power amp boards, but I'm guessing so some extent. It'll be obvious from my Temple Monoblocks review that I very much like them. The Bantam One without doubt takes a clear step and reaches the next level. This is as you would hope as the Bantam One with its linear power supply, preamp and classy chassis is around double the price of a pair of Monoblocks with switching power supplies and no preamp. Anyone having read and remembering my previous scribblings will know that I'm a single-ended tube and high efficiency / simple configuration speaker kind of guy. I am somewhat mad on vinyl, running two record decks and I also run a computer based digital source. In common with many others I find solid-state chip amplifiers to share much with a good tube amplifier and indeed any good amplifier. Once amplifiers reach the "good" category it starts to take a fair bit of listening to discern meaningful differences. I compared my 300B SE amplifiers with the Bantam One. At first I had a surprise, the 300Bs sounded shut in a dull in comparison. A quick delve into my stash of tubes allowed me to replace the 300Bs with some fresher examples, the 300Bs were singing again. It's interesting that it took the Bantam One to make me realize my 300B tubes were past their best. Of course the Bantam One will have no such expense or need replace key and expensive components. The 300B amplifiers have a certain flow to them; the soundstage of the 300Bs and Bantam One are just about identical. The tube amplifiers sound a little less distinct by comparison. Some may prefer the tubes but the precision and authority of the One makes it more universally acceptable and it is the amplifier I can live with better across all genres of music. Possibly with dreamy 1950's jazz the 300Bs are at their best and for that specific case would be my preference but overall the Bantam One is more consistently on song. The Bantam One wins in terms of separating bass notes. The upright bass being played on Strode Road from Saxophone Colossus by Sonny Rollins exemplified the quality of the bass delivered the One. Not only is there great separation and clarity in the bass, it also achieves what I'd call "walking bass" which is when the notes are so well defined they time perfectly, when the playing is good you really get into the musicianship on display. Switching to a very different vibe, Peter Gabriel Plays Live, on Not One Of Us there is a spoken intro, I've not heard it so distinctly before, there's tremendous clarity without starkness. I classify the Bantam One as sounding fresh and open. Detail is solidly present whereas the 300B more hints at the details which are hidden behind more powerful notes. Peter Gabriel has some very powerful drums in action; I was quite taken aback by the sheer force of the dynamics. Some of this due to my Trans-Fi Salvation turntable and the London Reference cartridge too but the Bantam One took what it was given a delivered several punches in the stomach. Impressive! The Bantam One sneaks the crown for the more crystalline treble where the treble is well recorded. Where the 300Bs do better is when treble is poorly recorded and then the 300Bs are more listenable whereas the Bantam One lets you know what the recording is really like. I characterise the overall difference as the 300Bs painting the music with a bigger brush which delivers the bones of the music well but misses out some fine detail. The One is more detailed and controlled and uses a finer brush. There's no question the bass from the One is more powerful, defined and realistic; another example being Henry Mancini's Return of the Pink Panther where the double bass stands wonderfully on its own as an instrument. With the 300Bs it still sounds good but is a trifle lost in the mix. I ran the Bantam One with my 100db sensitivity Bastanis Atlas open baffles and some slightly less sensitive DIY Mark Audio based open baffles, which are about 96db. I also used the new MarkAudio-SOTA Viotti One reflex speakers, the Viotti Ones are specified with a sensitivity of 88.5dB/W/m so these are more typical than my high efficiency open baffles. The Bantam One exhibited a clear advantage over the 300Bs with the ViottiOne, it seems my 300Bs prefer to operate with around 95dB+ sensitivity upwards, which is no great surprise. It was only with the very high sensitivity open baffles where I had a slight preference for the 300B and even this was not with all material and genres. With the DIY open baffles and the Viotti Ones I preferred the Bantam One. The diminutive Bantam One is a simple yet brilliant integrated amplifier; it's very nicely finished, performs really well and will match a wide range of typical speakers. The amplifier being 90% efficient even has great green credentials.